Nitin Bawankule, Country Director - India, Google Cloud, discusses the future of cloud computing and the challenges his company is addressing. Google has been one of the earliest adopters of cloud and one of the early entrants into the cloud market. Its cloud services cater to a billion users worldwide. 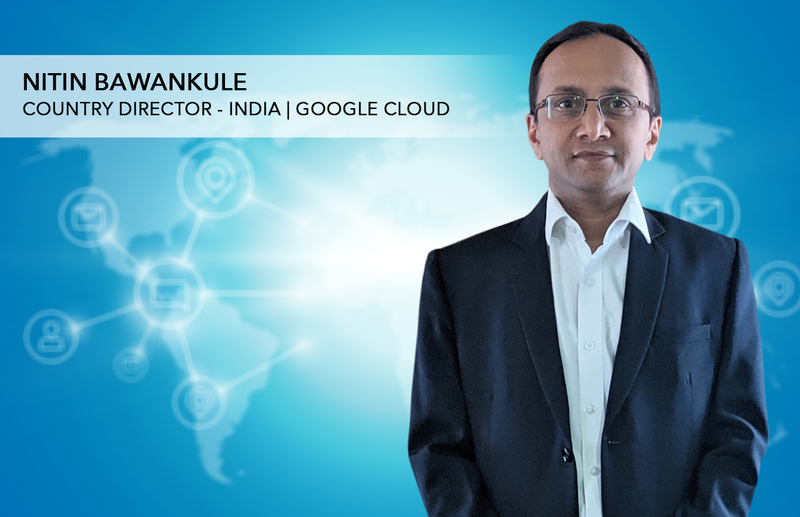 Nitin Bawankule, Country Director - India, Google Cloud, is bullish about the adoption of cloud services in India. In this exclusive interaction he exuded confidence about the ability of cloud service providers to alleviate user concerns like business continuity, data protection and security. How are the market forces shaping cloud computing’s future in India? How are you seeing organisations adopt cloud technology? Cloud computing is maturing at a scale and speed that can be hard to keep up with. According to LogicMonitor’s ‘Cloud Vision 2020: The Future of the Cloud Study’, digitally transforming enterprises (63 per cent) are the leading factor driving greater public cloud engagement or adoption today. Business leaders across industries are increasingly adopting cloud technology because they understand it helps solve a number of real challenges—teams work better together, data becomes useful to make smart decisions, and companies create new value to stay competitive in a quickly changing economy. As per Gartner, by 2020, the public cloud services market in India is poised to reach $4.10 billion. We are very excited by the growth of paid Google Cloud Platform (GCP) customers in India. Google has been running its own services in the cloud for over 14 years and today we host 8 Google applications, each with more than 1B users. Many of our customers are also choosing Google Cloud for our smart data analytics, machine learning and artificial intelligence capabilities. Google Cloud touches every layer of the business and includes GCP with offerings that span storage, infrastructure, networking, data, analytics and app development; machine learning tools and APIs; G Suite's collaboration and productivity tools; enterprise Maps APIs; and Android phones, tablets and Chromebooks for the enterprise. What do you think are the challenges cloud service providers like Google face within the enterprise space? As more businesses move to the cloud, we see the need to help bridge the cloud technology skill gaps. That's why Google Cloud is accelerating the development of cloud-first skills and talent, and we've seen a huge jump in the community of learners in India in the past year. The number of people in India who have invested 4+ hours in online and classroom education on Google Cloud has increased 825 per cent year over year. Another challenge is connecting customers’ legacy systems with newer cloud-based business applications, while managing the existing complexity at enterprises. At Google Cloud Next last year, we introduced our vision for Cloud Services Platform, and announced it is available in beta this month. CSP is a modern platform that simplifies building, running, and managing services both on-prem and in the cloud. Built on open APIs, CSP is a less disruptive and more compliant approach than competing hybrid offerings. CSP gives you the freedom to modernise your applications at your own pace, innovate faster, and improve operational security and governance. Do you see large enterprises moving critical workloads to the public cloud in the near future or do you see them mostly going for a hybrid cloud model? Why do you think that is the case? Every single company and their IT needs are different, and no company is the same. Given the reality of the market, customers need to run what they want, where they want. We understand that a significant number of enterprises require a hybrid or multi-cloud strategy. We have three ways of helping customers avoid lock in, while fully taking advantage of the benefits of Google Cloud. First, we are committed to providing an open, consistent hybrid environment built on the open source framework of Kubernetes. This gives customers the option to move workloads freely between public and on-premise environments and benefits customers like L.L. Bean, whose long-term goal is to build a multi-cloud IT architecture. Second, for customers who want to modernise in place—whether due to regulatory or compliance requirements —we have CSP, our hybrid cloud operating platform based on open source that works consistently anywhere—in the cloud and on-prem—reducing cost and optimising resources. Recently we announced the beta of CSP, bringing our customers a hybrid offering that extends Google Cloud services and the power of Kubernetes and Istio into customer on-premises infrastructure. Third, we have substantial customer demand for a modern, hybrid solution based on CSP and we are working with several large customers on their deployments. When it comes to multi-cloud, we don't view it as a zero sum game and we have many customers that work with us and other cloud vendors, including HSBC and Ubisoft. Business continuity is a critical issue for enterprises. How do you see cloud service providers addressing it? Customers want flexible, reliable and cost-effective products and features they can use to build or augment their business continuity solution—regardless of where their production environment is, ie on-premise, GCP or another cloud provider. Ultimately, they will look to work with the cloud provider that they can trust, that has a global network that can provide strong redundancy, reliability, availability, and the ability to scale traffic when there are big spikes in activity. This is where Google has the advantage. With 18 regions to choose from, customers are using GCP to back-up or replicate data to a different site within the same continent or even to a site on a different continent. Our Cloud region in Mumbai offers several services including Compute, Cloud Spanner, Big Data, Storage and Networking. With the India region, enterprises are able to take advantage of the high speeds, low latency and performance benefits uniquely offered by GCP services. Last October we also announced that customers can now choose to store their data in a dual-regional Cloud Storage location, which is a pair of specific GCP regions. By storing data in a dual-regional location, they enjoy the availability and business continuity characteristics of geo-redundant storage with predictable, low-latency storage access for co-located compute resources. Dual-regional redundancy type joins the other two options currently available from Cloud Storage, namely regional and multi-regional cloud storage locations. Compliance and security are two other issues that are of concern to enterprises. How are you addressing them? Google’s security is unmatched. We've been operating securely in the Cloud for almost 20 years. We have taken the lessons learned from protecting eight apps with more than a billion users each to protect our Cloud customers, and we externalise many of our practices to empower our customers and give them control over their security. We manage a large amount of the world’s Internet traffic. We protect our customers and help keep the broader Internet safe with technologies like Safe Browsing, which protects more than three billion devices every day from suspicious websites and files. We think about hardware at the deepest level and have proprietary technology that helps ensure nothing is running on our infrastructure that shouldn’t be. In March 2017, we introduced the Titan chip—a Google-designed chip that helps ensure this. We are also founding members of the FIDO alliance, which created the standard for security keys that provide strong two-step verification to protect user accounts. This summer we released our own security key—the Titan Security Key—an additional layer of protection in the form of firmware designed by Google, helping ensure nothing on the key has been tampered with, during manufacturing or otherwise. We also developed the BeyondCorp framework to determine access based on devices and identity instead of a perimeter-based approach, and are helping customers adopt a similar approach.